Dill Essential Oil has traditionally been used to support a healthy digestive system*. It is stimulating, revitalizing, and balancing. Steam distilled from the entire plant. Roman gladiators rubbed Dill on their bodies, believing that they could reduce nervousness and stress before battle. Today, we use Dill essential oil to balance emotionally and uplift the mind. Did you know that diffusing Dill with Roman Chamomile may help restless children? Roman Chamomile and Dill are both are calming. Dill energetically helps to focus intention and bring clarity of expression. 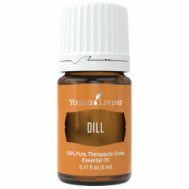 Want to Purchase Therapeutic Dill Essential Oil? Go to the Oil Shop! Buy Dill Oil Here! What are the Documented Uses for Dill? Culinary uses. What is the Aromatic Affect on the Mind? Its fresh and sweet aroma is calming. What is the Spiritual Influence? Dill assists in the power of visualization and intention. It grows by itself; therefore, it can bring focus to our spiritual singularity or purpose. Many times we want to help and make a difference in the world by "taking on the world"; however, that is not always helpful. Dill helps us understand that focusing on our own spiritual mission is where we can really make the most difference in the world. And it asks us to form that vision for ourselves. What Chakra is Affected? Solar plexus and throat chakras. Interested in Dietary Dill Oil for Your Culinary Adventures or Dietary Supplement? Then check out Dill Vitality Essential Oil! There are many Dill uses because it is Generally Regarded as Safe (GRAS). Did you know that the Ancient Egyptians used Dill as an ingredient in a pain killing mixture? Place Dill Essential Oil on the wrists to lessen the emotional energy attraction to sugar!